AV integration from start to finish. As part of our commitment to integrate our communication solutions to your business, SENSUS Communication Solutions offers complete AV integration from our team of accredited technicians. Thanks to our Canada-wide scope of operations, we are able to accommodate all your AV installation and integration needs throughout the country. Our Audio/Visual experts can integrate with any of the systems you’re currently using, such as Skype for Business, no matter your office’s infrastructure. Moving to a new location? Renovating? We can help. SENSUS can provide guidance and complete AV integration services to equip your entire new office, anywhere in Canada. 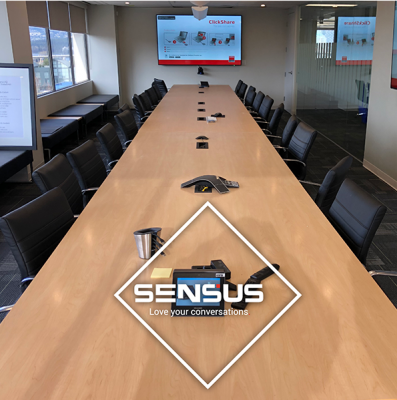 SENSUS offers quality and timely AV installation services to get your boardroom connected as fast possible. SENSUS Communication Solutions has been in the telecommunication industry for over 30 years. This has allowed us to become experts in all aspects of audio-visual equipment, both hardware and software. Paired with close direct partnerships with some of the largest manufacturers of teleconference and video-conference solutions, our expertise is second to none, no matter how small or large your meeting space may be. Here are just a few advantages our customers get when working with SENSUS. Want to bring your meeting room into the 21st century without lifting a finger? SENSUS can handle it all.